Palestinian laborers work at a Jewish settlement near the West Bank town of Hebron on October 17. 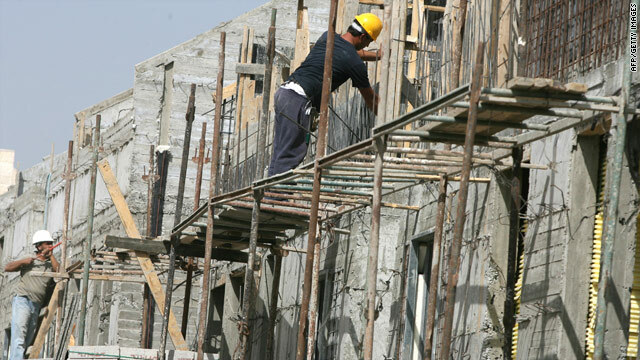 Palestinians call the development "alarming"
Jerusalem (CNN) -- Construction has started for about 600 new housing units in the West Bank since the Israeli settlement freeze ended late last month, the group Peace Now said Thursday. Yariv Oppenheimer, the group's director, said the Israeli peace organization has surveyed the construction activity and will come out with a detailed report next week. The group has long monitored Jewish settlement activity in the Palestinian territory of the West Bank. The settlement construction issue is threatening to scuttle the reactivated and now stalled peace talks between Israel and the Palestinians. The Palestinians demanded a continuation of the settlement freeze in order to continue with the talks, and the United States has urged Israel to stop settlement activity. But the Israeli government has not continued the freeze. A source in the office of Israeli Prime Minister Benjamin Netanyahu, who asked not to be identified because he is not authorized to speak about the issue, said, "it is clear" that any "limited" construction won't alter "the future peace map and that there is a need to return to the negotiating table." The source said a large part of the construction is in the existing settlement blocs. Ghassan Khatib, a Palestinian government spokesman, told CNN that the settlement building reports "are very alarming because it is happening on the expense of our basic rights, on our land, and because it will reflect negatively on the sincere effort that the United States and the Quartet members are undertaking to resume a meaningful political process," a reference to the United States, Russia, the European Union, and the United Nations. "We also think that this is a big challenge to the American efforts that would require doubling the pressure on Israel to respect the international legality and requirements of the peace process." Dani Dayan, the chairman of the Yesha Council, which represents Israeli settlers, said life is back to normal in the West Bank. "In the last 10 months there was no new construction. After the freeze ended, private people and private contractors who already have building permits decide if they want to start building or not; it's their own private decision. Most of the construction is happening in the settlement blocs." Former U.S. President Jimmy Carter, in Israel as part of a mission of world leaders called the Elders, told reporters he hopes Israel will halt its settlement activities long enough for the talks to resume. He noted that Palestinian leaders said they wouldn't go back to the table as long as the activity continues. Raising the issue of what would happen if direct talks were not resumed, he said the Palestinians could pursue other options, such as asking the United Nations for recognition of a state of Palestine on lands seized by Israel during the 1967 war -- Gaza, the West Bank and East Jerusalem. U.S. Secretary of State Hillary Clinton said Wednesday the U.S. position on settlements is "well-known and has not changed. And our determination to encourage the parties to continue talking has not wavered. "We have no illusions about the difficulty of resolving the final status issues of borders and security, settlements and refugees, of Jerusalem and water. And it's no secret that we are in a difficult period." At a Washington event for the American Task Force on Palestine, Clinton said authorities knew "there would be setbacks and struggles" when Palestinian President Mahmoud Abbas and Netanyahu came to Washington in September to relaunch direct talks. "I cannot stand here tonight and tell you there is some magic formula that I have discovered that will break through the current impasse. But I can tell you we are working every day, sometimes every hour, to create the conditions for negotiations to continue and succeed," said Clinton. "We are urging both sides to avoid any actions that would undermine trust or prejudice the outcomes of the talks. Sen. Mitchell will soon return to the region for further consultations," she added, referring to former Sen. George Mitchell, who is the Obama administration's special Middle East envoy. "We have not given up and neither have President Abbas or Prime Minister Netanyahu." The American Task Force on Palestine is a nonprofit, nonpartisan group "dedicated to advocating that it is in the American national interest to promote an end to the conflict in the Middle East through a negotiated agreement that provides for two states -- Israel and Palestine -- living side by side in peace and security," according to a statement on its website.